(LOCATION: Palm Coast FL) Looking for trawler comfort and cruiser performance? The Tollycraft 48 Motor Yacht offers both with this roomy two stateroom cruiser. She comes with a spacious flybridge with full enclosure, a sun deck with room for dinghy, cockpit, roomy salon, full galley with dinette, and two private staterooms. The flybridge is large with bimini top, enclosure, and ample seating. The forward helm has captain and companion seating. There is a wraparound guest lounge. Theres is ample room to relax, dine alfresco, or entertain in style. The open sun deck has room for dinghy and features a hinged mast for bridge clearance. The main deck provides easy movement from the bow pulpit with anchor and windlass with side deck access to salon and back to the open cockpit. The cockpit has room for fishing or relaxing with access to a large swim platform. The air-conditioned salon is open with large windows for lots of natural light and blinds for privacy. Port side is a large comfortable sofa with coffee table. Two swivel chairs are located to starboard. The lower helm station is forward to starboard. The galley is down port side with booth style dinette to starboard. There are two private, air-conditioned, staterooms. The forward guest cabin has V berth, under-berth storage, hanging locker, and private head compartment. The master aft cabin features queen berth with ample under-berth storage, built-in cabinets, hanging locker, flat screen TV, and en suite head compartment. UNBRIDLED is powered by twin Caterpillar diesel engines with 320 horsepower each and 3000 hours. Mechanical features include an new 16-kW generator and reverse cycle HVAC. She is a full featured cruiser with comfortable accommodations, is well equipped, has been well maintained, and is ready to cruise. 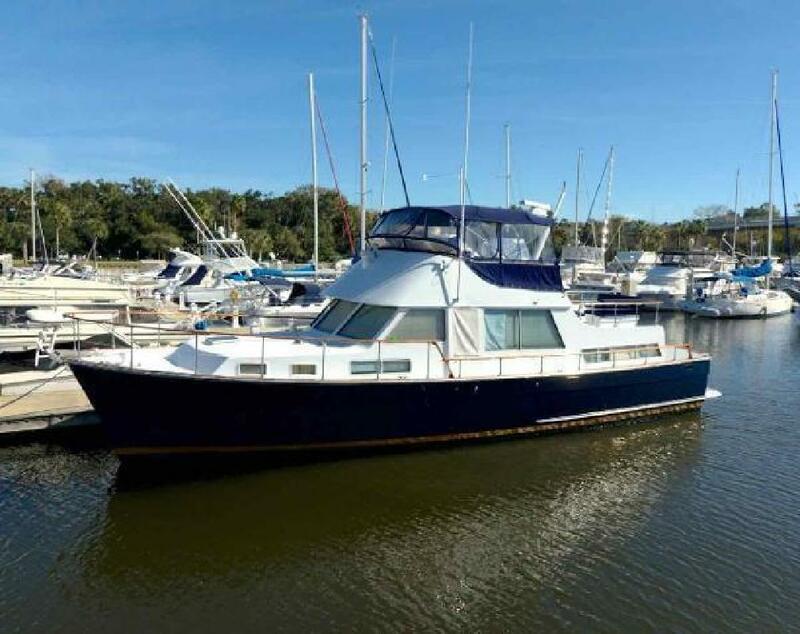 Call now for more information and to schedule a showing of this 48 Tollycraft trawler. Draft: 3 ft. 8 in. Beam: 15 ft. 2 in.